What Does Your Birth Month Tree Reveal About Your Personality? Home » Lifestyle » What Does Your Birth Month Tree Reveal About Your Personality? 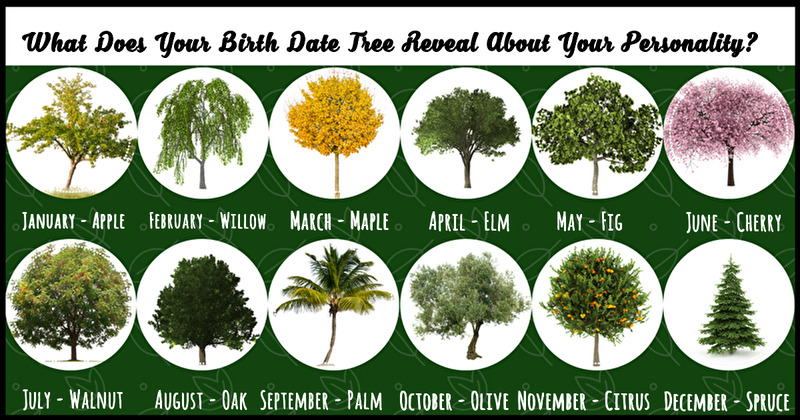 We all have a birth month tree, but did you know it reveals traits in our personality too? Read below to learn what your birth month tree says about you. You are gracious, characterized by your unmatched ease and good taste. You listen carefully to others with interest and always know the right thing to say at the right moment. When entertaining, your gracious hospitality shines. Your compassionate heart and pleasantly kind demeanor draw people to you instantly. No matter what life throws at you, you remain resilient. You have been through more trials and tribulations than anyone you know, yet you stay strong. Though people try to keep you down, you are one of the most optimistic and hopeful people. You will try anything because the worst that can happen is you fail, and that’s already happened and you made it through. Being an outspoken person, you have the unique quality of not being afraid to speak your mind. Standing up for what you believe in and know is right is one of your best traits. Your unreserved nature extends to those you love and care for and you are always willing to verbally support those fortunate enough to be considered your friends. You were born to make and fix things. Whether someone needs furniture built, a shelf put up, or a sink unclogged, you know what to do. You are naturally “handy” and can figure out any problem. You are dedicated to putting 100 percent into everything you do, including nurturing your relationships, so you are a loyal friend. Your deep desire for success has driven you to be the ambitious person you are today. Seeing obstacles as a challenge or a minor setback, instead of a defeat, has allowed you to accomplish things others would have simply given up on. You have an earnest desire to be distinct, which is not only the key to achieving your own goals but motivates those around you as well. No one is a harder worker than you. You throw yourself full-force into everything you do. If someone asks you for something, you will never do it half-way. But this doesn’t mean you’re all work and no play. You also love to socialize and can make friends with just about anyone. You are a great conversationalist and let people know you are really listening. Happiness beams outward from you, the radiant person that you are. Your brilliance and zest for life are evident in your demeanor and appearance. Allowing your inner happiness to escape has created a glow around you that is impossible for others to ignore. Your contented bliss makes you a truly beautiful specimen. You bring out the best in everyone. Even on your bad days, you always stay positive and offer up a smile. When your friends are in a bad mood, they seek you out; you will know just what to say. Your goal in life is to make others happy and you often spread yourself thin trying to please everyone. As a fully empowered person, you have enabled yourself to achieve great things in life. You have taken responsibility for your life and made your own set of rules to live by. You honor yourself by trusting your intuition and gut instincts. Empowering yourself through your passions, your relationships, and your beliefs makes you irresistible to those around you. Fearless should be your middle name. You never say no to trying new things or exploring new places. You are the ideal travel or party partner because you get everyone out of their comfort zone and into doing awesome things! You love to gather experiences and get the most out of life while you’re young. Though you love to have fun, you are never reckless. You are a compassionate person with a tender spot for all living things. Throughout your life, you’ve discovered that it is not the material things that you measure your success by, but the way you’ve treated and empathized with others around you. You are mindful of your emotional intelligence, and people that have been touched by your kindness are inspired by your warm-hearted nature. You have fire in your soul. To some it may come off as mean, but you are just super passionate about everything. Injustice, big or small, boils your blood. From a wrong fast food order to a political protest, you always want to see people get what they deserve. You are a great friend to have because you will always stick up for others.